UNITED NATIONS, August 5 -- The UN's lack of transparency about the delay of medevac helicopter transport from Abyei of three peacekeepers who died after a landmine explosion grew worse on Friday, highlighting the UN's lack of planning for the UNISFA peacekeeping mission of Ethiopian soldiers it is paying from in Abyei. 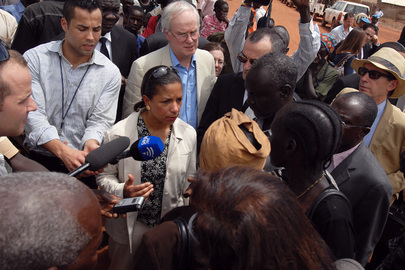 This is a request for comment from the US Mission or Ambassador Rice on Alain Le Roy's reply just now to Inner City Press, on UN TV, that in the case of the Abyei peacekeepers who died after mine explosion, the Sudanese government "prevented us to take off... by threatening to shoot at the helicopter." http://www.unmultimedia.org/radio/library/2011/08/40554.html?app=6&lang=en from Minute 46:53. What is your comment, will you be seeking action in the Security Council, and what is your position on there not being a signed SOFA for UNISFA in Abyei? Relatedly, what follow up will you seek on the UN Human Rights report on Southern Kordofan, which DPKO has still not released but the leaked copy of which describes war crimes as well as inaction, even before July 9, by the Egyptian battalion of UN peacekeepers in Kadugli? Neither lead spokesman Mark Kornblau nor his deputy, admittedly out of the office and about to leave the Mission for non-spokesman work with the State Department, responded to these questions. Watch this site. That has become Nesirky's, and Ban Ki-moon's refrain.